In various shades of dark and darker, Robert Dunbar presents a collection of short and often disturbing little tales. I had been interested in sampling the work of this author for some time, his name often associated with a sub-genre of horror labelled literary horror. 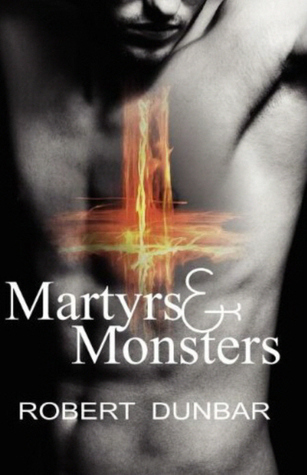 So when the opportunity came up to read and review Martyrs & Monsters, I jumped at it. Fifteen stories and some contemplation later, I can write that although I found the collection of stories to be a bit hit and miss for me, there was a writing quality throughout that convinced me that with the right subject matter, reading Dunbar’s work would be an absolute pleasure. Of all the stories, the first, Getting Wet, was my favourite. The setting, the mood of the narrative and the elements of back-story I could piece together worked perfectly for me. It was the only story that chilled me abandoning the supernatural for the psychological and using silence as a weapon against the composure of both the protagonist and reader. It’s an impressive start to the anthology. Of the remaining stories, I liked Red Soil which was a fascinating blend of vampire and zombie mythology with a particularly bleak setting. It felt like a dreamscape of sorrow to which both the mindless and the cunning of the undead had laid siege. Like a Story presents two children that creep into the lion’s den, but by the end of the tale I was’t sure who was the beast and who, the lamb. Away presented a mystery suspense, a conspiracy of alien infiltration that may have existed inside a tenement, or inside a psychiatric ward; the pleasure being in the uncertainty. Full was a surreal setting and narrative which gradually brought me through various oddities towards a passionate and violent conclusion that satisfied. However, although certain stories stood out to me, others fell a little flat. I felt that both Gray Soil and High Rise offered me nothing compelling to hold on to; likewise, The Folly, The Moon Upside Down and Killing Billie’s Boys. None of the stories were poorly written, they merely failed to move in a direction that interested me. Alongside these, I found a couple of the stories a little too cute in their composition – Explanations and Saturday Night Fights being the main offenders. Only one story actually stood out as completely unlikable to me, which was Only Disconnect. The story matched the title – a pointless series of events that made no sense and held no interest for me. One of the aspects of the author’s writing which I found consistently successful, whether or not I enjoyed the story itself, was his ability to paint with mood. Dunbar has a way of injecting settings with the appropriate level of menace, brooding or despair for me to both picture the surroundings and also feel the atmosphere. He does this so well that I still have fairly vivid memories of the small worlds he created in his stories weeks after reading them. I think if you like dark fiction that has fairly strong LBGT representation, blends psychological with supernatural and is executed in well-written prose that successfully evokes mood, you will like this anthology. For me, the stories that I enjoyed outweighed those stories that didn’t make as much of an impression and even those that failed to thrill were mostly worthwhile experiences when considered a fraction of the whole. I’m certainly looking forward to reading a novel-length work from this author. This entry was posted in 3.5, Anthology, Horror, Reviews and tagged Dark Fiction, Horror. Bookmark the permalink.